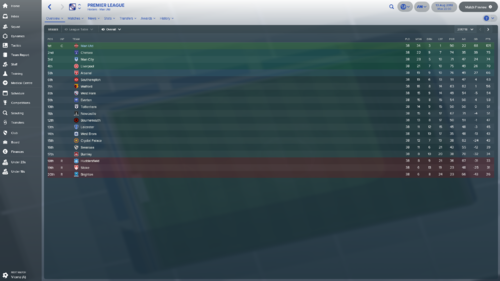 I'm in April with my save using the 4-4-2. We've already won the league. In 32 games we've won 29, drawn 2 and lost 1. There were a lot of flukey wins along the way. Quite a few tight 1-0's, and games where we win via a lucky own goal or penalty decision going our way. It has been fascinating to watch, I've seldom had to do anything tactically - we got lucky with some decent wins early on and it seems everyone decided to go defensive against us from September/October, which just made things even easier. I got out of the Champions League group which had Roma, At. Madrid and Leipzig, which wasn't pleasant to play in. In the Semi-Finals now having beaten AS Monaco and Besiktas. Hoffenheim are the semi finalists. Lucky draw really. Juventus and Barcelona are in the other semi-final. Won the League Cup against Liverpool. Have Manchester City in the FA Cup Semi-finals. That should be interesting. We've done ridiculously well considering how many injuries we've had. Smalling broke his leg in pre-season. Martial broke his leg in September in a match. Pogba broke his ankle and Jones broke his foot in November, Sanchez broke his ankle in December and then in January, Mata tore his groin. Only one major signing; de Ligt from Ajax, wonderkid defender to partner up with Bailly in defence. I sold Darmian in the January window as well, and Ashley Young left on loan but otherwise it's just the base squad (first windows disabled). Lets see your squad. Im now considering signing Lucas Vasquez for £16 million in first window so Sanchez can play up top with lack of strikers for a 4-4-2. I'm at the final pre-season match now, just beat Chelsea 2-0 in the Charity Shield. That's my main squad. Valencia wanting away to PSG at the moment, but I hope he stays as I really don't have any cover for him. No chance I will ever top that. I've never ever come close to that good a performance, usually I lose 5 and pick up a lot of draws, but that season was ridiculous. We ended up winning the FA Cup too, Bournemouth in the final. Lost the Champions League though to Barcelona quite handily, spanked us 3-1. That's the main formation I run on. I'm going back to experiment on having a box to box rather than a CM/S for this season. Initially I had Pogba as a roaming playmaker but when he got injured I played more conservative and since we kept winning I never saw any need to adjust the role again. Wow! That league table for first season is impressive. Never say never, anything can happen. Could sign a player to make the difference in bettering the season records. Who do you play as the Deep-Lying forward and who's second choice? I know Tom Rogic from Celtic has all the attributes for the Deep-Lying Forward so its a debate weather he can succeed there or not as he's not even competent in the striker position/role. Who do you play as the Deep-Lying forward and who's second choice? In the first season: Sanchez, with Zlatan as backup, Lukaku played there if there was an injury crisis. I preferred Lukaku in the AF role with Rashford as backup. Oh and this is ridiculous, but where we had a big injury crisis (Sanchez, Lukaku and Zlatan injured), I actually played Fellaini in that DLF role, he's not actually that bad attribute-wise there, but only as an emergency option for me. For the new season: Sanchez will be the first choice, with Lukaku dropping to that role if Sanchez gets injured. I haven't replaced Zlatan (retired), but part of the reason for this is I have an U18 prospect striker that came out of the academy with 15 Finishing and off the ball as his starting attributes .. So, I might get to use him. Risky, but we'll see. Not using custom database, 18.3. Before even loading in, I have an idea of who I want to try and build around. 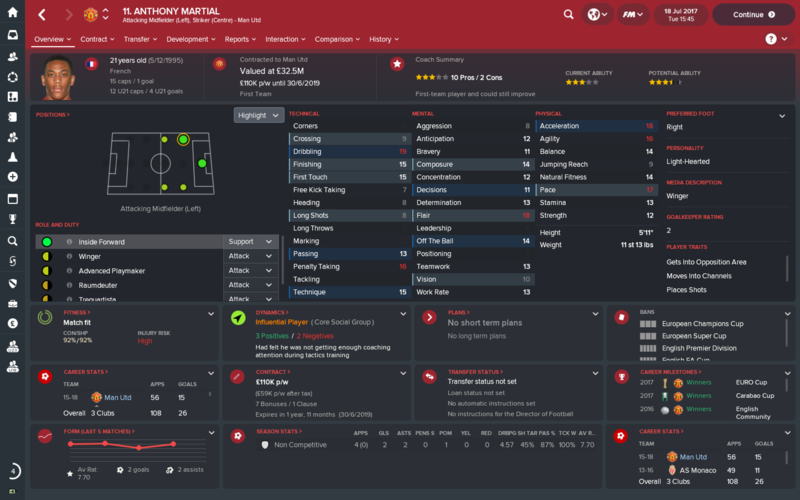 I want to make Martial a beast. I've not done any research on if he becomes good, but quick flick through the posts on this thread, not too many mentions for him. But still I want to make it work. Will post a small update with my squad evaluation, but like I say, no first window. 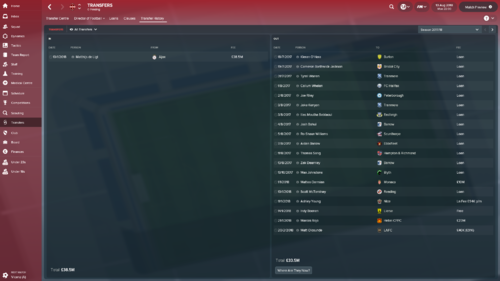 Safe to say that disabling the first transfer window may have been a mistake. The main issue is with the staff, since I can't pay any compensation. Is it a licensing issue? I've had to hire a few not so good coaches just to try and raise overall quality and reduce work loads. Leaves me doing the shooting and attacking. The squad itself, it's a bit of a mess isn't it. Under 23 squad has more goalkeepers than required for all 3 squads combined, and in general there are just too many players in all 3 squads. No wonder it was difficult to reduce coaching workloads. Linelof's heading needs to improve, but him and Bailly can be the CB's for the next 10 years. Both physical beasts, where I can afford now to play a high line. De Gea is De Gea. Romero is a decent back-up. Smalling and Jones both good enough to cover the other two. Rojo out for a while, not really in my plans, but capable cover if needed. Full-back situation is a strange one at United. Shaw is out for a while still, Blind is slow and I would prefer using him as back up in midfield, Young is really a winger, as is Valencia really, Darmian is solid but offers nothing going forward. Be keeping close eye on the full backs, as think may be where I first enter the market in January. This is where it's a struggle for me. I've got 3 DLP's, a tree, a workhorse, and a Pogba. There's no style of player, it's all very different and doesn't really fit together that nicely. I don't want to build around Pogba, I want to build around Martial, so finding the right setup here is a challenge. Again the attacking players are all so varied, it's hard to slot them all in. But there is a lot of quality here, shouldn't be difficult to score goals with this lot. He has some very, very good attributes: Dribbling, Finishing, First Touch, Off the ball, Composure, Pace, Acceleration, Agility, Balance, flair, technique. However his anticipation, decisions, and vision is low. He's light-hearted and only 13 determination. Can't tutor him, so going to have to hope can raised this through squad dynamics and sign lots of high determination, good personality players. Training him as complete forward to try bring up those attributes as well. Lots of quality players in the squad, but in terms of a style of play, it's all over the place. Fitting them all in isn't going to be easy. I want to build around Martial, so I may end up with a couple unhappy superstars. I blame Mourinho personally. Will post tactics the friendlies done, still not 100% on them myself yet. @craiigman if you set Martial to Hot Prospect one of Mata or Lukaku should be able to tutor him. I always start by getting him and Rashford tutored. Similar with Shaw I like to try get Valencia to tutor him, and Jones on Lindelof although in my save that I posted about in this thread Lindelof was still incredible even without tutoring. You can do that? I’ll get on it. He doesn’t moan about being changed does he? Does not give a damn. They never care about their squad status changing unless the playing time is downgraded to match, in my experience. Just watch that you change it back once you're sure the tutoring is working or he'll start asking for a contract "to reflect his importance to the team". I'm using Rashford as Complete Forward - Attack and Lukaku deep-lying forward - support. Then Sanchez as the Winger and the rotated striker until I can find a suitable winger to replace him with so he can fill the strikers role more frequent. Zivkovic is a key target but Benfica want 40% sell on profit which I refuse to agree on any purchase. 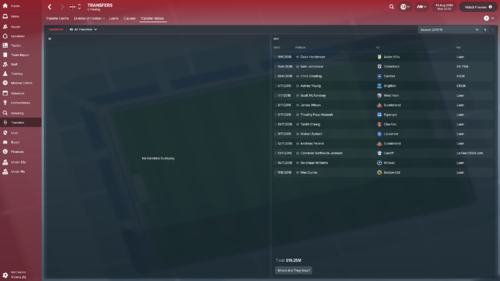 Do you plan to ever sell on Zivkovic? If you don't, up the sell on profit to 50% and then see if they'll accept a lower fee. If you ever need to sell, he'll be worth more, but sell for exactly what you paid for him, stiffing Benfica out of the money. Think of it as revenge for how they acted towards Vasteras when Lindelof moved, refusing to honour a sell-on clause and a games-played clause I believe. Had to go with Mata as Lukaku got injured in pre-season. I’m hoping once Mata is done I’ll be able to us Zlatan when he’s back. Just hope that he’s still tutorable by then. I’m keeping him on the left wing. He’s been bit hit and miss so far though. Probably my tactics. Still tinkering. Thought you planned to use him upfront? I thought the season was successful overall. 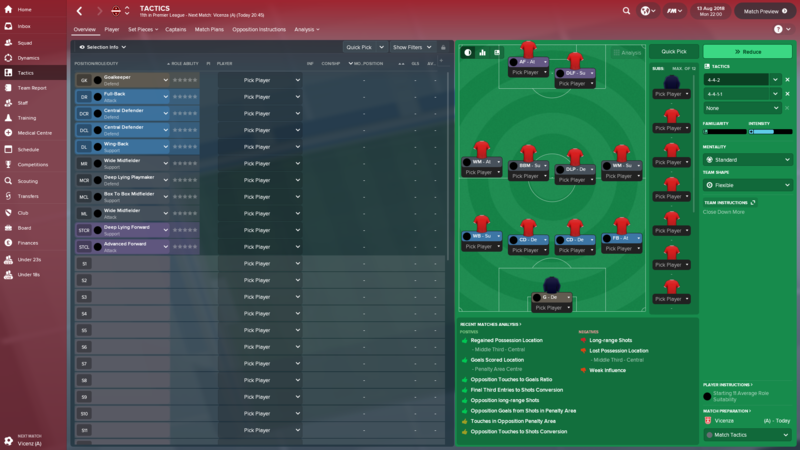 I completed a domestic double with the League and the FA Cup. I lost the League Cup Final and made it to the semifinals of the Champions League where I was beaten by City after injuries forced me to change formation. I played a strikerless formation that resembles a 3-4-3 ,involving a half back dropping between two center backs so that wingbacks can offer a wide threat. Two inside forwards flank a shadow striker while two box to box midfielders offer support at both ends. This formation's vertical compactness and the passing options that it gives players lets me play a possession based, expressive style. I also press the ball all over the pitch. 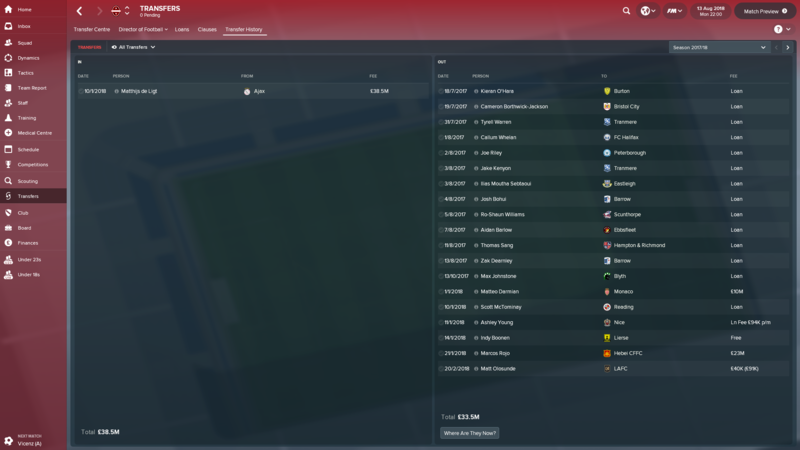 In my first January window, I got rid of a few players that couldn't fit my system, I thought I was able to get reasonable fees for them. I signed two players in those positions where I had weakened myself. Sergej is a starter, and De Ligt is on track towards being one. 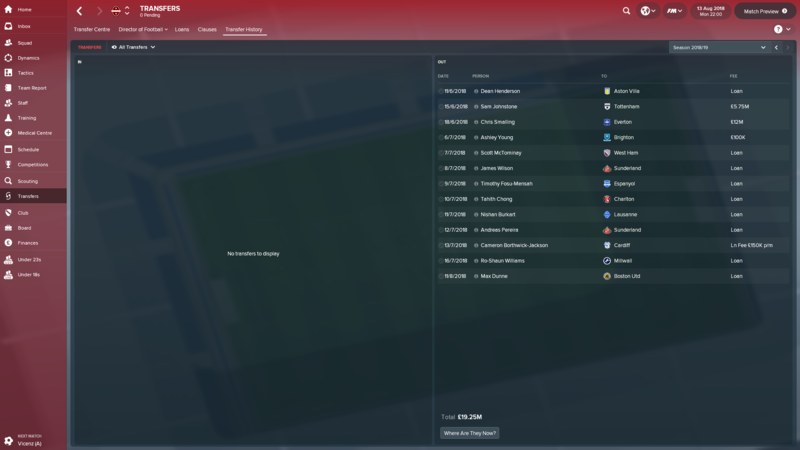 I have spent a lot of money, but my net spend is only around 60 million and I feel that I've got a complete squad. I sold my oldest attacker and my attacker least suited to my system, along with a few fringe players, for a very good chunk of money. 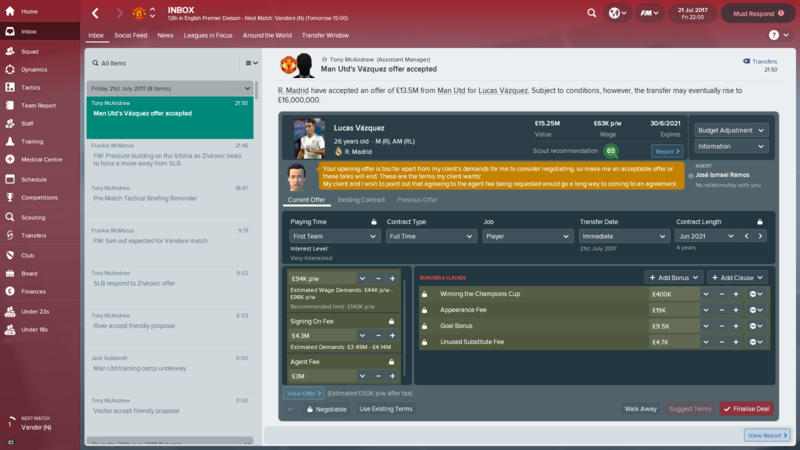 I signed a left fullback due to my only having one good one, two new attacking players who should thrive in my system, and Dier to compete with Matic. I am still smashing it as Manchester United and this game has been so easy so far see my league table. Last season was my best yet. we have won the champions league six years running. my squad is now like this. After coming off the bench after his £10 million transfer and then starting his first game gets an assist within 10 minutes and then before half time get his leg broken!! Maybe a bit late on this discussion. Starting a new save soon with United cause my hard drive crashed and needed to buy a new one, but I need some thoughts on a theory I have, till FM19 releases. Keep in mind I generally try to be as realistic as possible with my transfers. I've played several variations of a 4-3-3 in the past to accommodate Pogba. However, my favoured formation is a 4-2-3-1 with Pogba in a midfield 2 alongside someone more mobile than Matic, so I need a few suggestions here. The second part is just because I'm not a fan ofLukaku at all, and prefer him as a backup. I have an idea of either playing Griezmann or Dybala as the No. 10, albeit with different roles, bringing Rashford to the fore up front. Or playing Rashy as the 10 and opting for another out and out forward, but I don't consider this option much. The plan is to have the 10 operating as a second striker or similar. Now here comes the part I really need help and opinions on. Somewhat inspired by Guardiola on occasion last season, I want to consider using Inverted Wing backs. The idea is to have them become part of the midfield when we have the ball, allowing my midfielders to push higher, which gives them greater cover and creates space, while negating any backlash I would get from a team player 3 or more midfield players. So basically, need suggestions for a suitable partner for Pogba, can Rashly operate as the main forward, and if this formation and playstyle would be suitable and reliable, as well as who would be decent for the IWB roles. One more thing: although United have great future defenders in Bailey and Lindelof, I want to bring in one who is going to be the leader in the team. Cause United's leadership is severely lacking. But I haven't managed to find anyone truly suitable here. I have recently come back to my United save and would strongly suggest dropping Pogba back into DCM as a Segundo Volante (AT). Put Matic (or of you can get him, Ruben Neves is sensational) alongside as a DLP (D). I then purchased Milinkovic-Savic who played CM (B2B). The three were brilliant, but Pogba more so than any other has been easily the best player in the world, playing in that position allows him to pick the ball up deep, dictate the game but also chip in with a ton of goals arriving late into the box. Again here I would caution against knee-jerking Lukaku out of the team, I very much like you was not a fan, but stuck with him because no-one would buy him, I am now at the end of the 2025 season and he is the all time record scorer for United and the Premier League, regularly scores 40+ a Season as a Target Man or Advanced Forward. If you are looking for someone to rotate in the striker position who will score goals and not complain about being out of the team Timo Werner is excellent. As for Rashford his stats make him far better out wide, either from the left as an inside forward or from the right as a Raumdeuter (it just works) although at the start of the game this is the perfect role for Mata. i too was inspired by Pep and tried inverted WBs unfortunately with the current FB availability at United it didn't work and I conceeded way too many chances. I found it more stable with Standard FBs, however I think with the right training you may be able to get something out of Shaw. lindelof is an absolute monster on this game, easily became the best defender in the world on my save as a ball playing defender (cover) play him consistently and he will come good. Bailly again is excellent, but slightly more limited, better as just a standard defender. As for CBs to bring in although he may not initially help with the leadership qualities, Matthijs De Ligt is worth every penny you can spare. @MatthewS17 as the above post says, Lindelof is outstanding. If you tutor Bailly with either Jones or Valencia to get his professionalism up (you'll need to drop his squad status to backup to have them eligible for it) as he complains about training otherwise, between them you'll have one of the best CB pairings in the game. 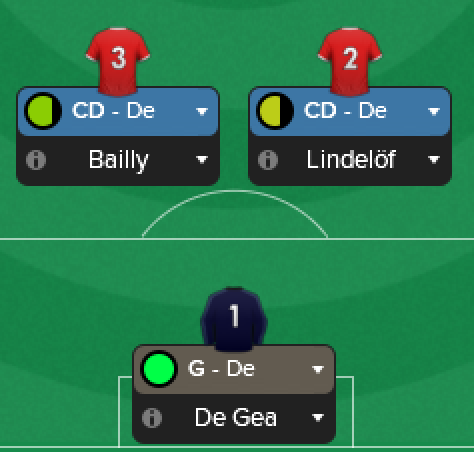 Then you just need to get a rotation option with a good personality - I've had great luck with keeping Phil Jones fit on this one, but the above advice about De Ligt is probably right, get him tutored by Bailly / Jones as well (you could tutor Lindelof too but he did fine with his base personality for me, both him and Bailly did actually, just I hate players complaining about tutors) and make sure he gets enough game time and you've got 3 world class CBs right there. You might have to wait a season, but David Alaba would be an outstanding IWB as from memory he's reasonably two-footed (fairly strong or higher on his weaker foot). If you aren't playing a high line Blind would do a job for the first season at left IWB. Shaw is far too one-footed for it. You probably want to tutor him too. One thing about IWB though - to get the best out of Martial / Rashford (assuming you're playing one of them out wide left) you would play them as an inside forward, you then wouldn't want to put an IWB behind them, you'd want a full back who stays wide. have recently come back to my United save and would strongly suggest dropping Pogba back into DCM as a Segundo Volante (AT). Put Matic (or of you can get him, Ruben Neves is sensational) alongside as a DLP (D). I then purchased Milinkovic-Savic who played CM (B2B). The three were brilliant, but Pogba more so than any other has been easily the best player in the world, playing in that position allows him to pick the ball up deep, dictate the game but also chip in with a ton of goals arriving late into the box. You mentioned Savic? Does that mean that you're playing a midfield 3 or 2? I did a little experimenting today with Pogba as a Segundo Volante, albeit on support. The concern I have is making sure there are a suitable amount of players behind the ball if I'm caught on the counter, or getting overrun in midfield, which could happen against a big team playing a 3 man midfield. I'm considering conceding defeat and just reverting to a 3 man midfield here. In which case, I considered D. Alli, as he plays both the No.10(if I ever decide to use it) and deeper in midfield as a Mezzala, which is a role I use anyway. Not sure if this is a good idea, though, and it puts me off as also being rather unrealistic. Dybala or Griezmann felt more of a suitable signing were I to raise United back to their title winning status again. I get this, and maybe I'm not using him correctly, however, in my lost save, he just always seemed to miss several chances before scoring(as a Target Man, and as a Complete Forward), and I usually having a preference for pacy, creative forwards. Rashford's stats make him better out wide, I know, however I have Martial there who is probable my most effective goalscorer and match winner in the second half of the season(Sanchez quite dominant in the first, but tails off). He averages a goal every 86 minutes which was the highest in the league. Also, my right wingers are usually traditional out-and-out wingers, so Rashford isn't in that mould. I feel my new save would be no different, therefore he's quite undroppable. That leaves me with a Rashford/Martial rotation option, which I don't like. We all know that quality home-grown players are at a minimum for United, so I usually want my first XI ti always have at least 3 English players in the Matchday XI(hence why Shaw is still my main LB). I looked at perhaps Shaw, Rashford as the main CF, and Lingard on the right(temporary, not permanent) allowed me to meet that requirement, and if Alli came in, even better, even though I prefer Dybala. I've also had to consider this because the English players in my team constantly want to leave for a new challenge and even those that gained citizenship(Young, Smalling, Jones, Valencia all want a new challenge, and Carrick's retirement as well. If I'm truly honest, I'm not really sure what to do here. indelof is outstanding. If you tutor Bailly with either Jones or Valencia to get his professionalism up (you'll need to drop his squad status to backup to have them eligible for it) as he complains about training otherwise, between them you'll have one of the best CB pairings in the game. Based on both of your reasoning, I'll stick with Bailly and Lindelof. Won't sign De Ligt, as I want to pay full attention to the defensive options that are in the academy for development. Was considering Bonucci, but he's unsignable or really not worth it. I'll also forego why IWB idea. Yes, I realise I'm terribly fussy. Thanks for all the replies so far. Keen to hear what you think on the above. @MatthewS17 Bonucci is amazing on my Milan save, but yeah he'd be incredibly difficult to pry away, and is one outrageous wages. Completely forgot about Tuanzebe as I have no idea what he's doing in real life right now, but he can become your 3rd choice centre back easily. Has "Brings Ball Out Of Defence" ppm which is cool too. You mentioned Savic? Does that mean that you're playing a midfield 3 or 2? I did a little experimenting today with Pogba as a Segundo Volante, albeit on support. The concern I have is making sure there are a suitable amount of players behind the ball if I'm caught on the counter, or getting overrun in midfield, which could happen against a big team playing a 3 man midfield. Probably should have been a bit clearer on that, yes I play a 3 man midfield of DM(DLPd) and SV(A) with a CM B2B when playing away or against teams I expect to cause me issue. At home or against teams I expect to beat I move the CM to AMC. The partnership of DLP and SV has been very solid with or without the extra man. I'm considering conceding defeat and just reverting to a 3 man midfield here. In which case, I considered D. Alli, as he plays both the No.10(if I ever decide to use it) and deeper in midfield as a Mezzala, which is a role I use anyway. Not sure if this is a good idea, though, and it puts me off as also being rather unrealistic. Dybala or Griezmann felt more of a suitable signing were I to raise United back to their title winning status again. I've not had Alli on this game, but cannot extol the virtues of Savic enough if you want a player with plenty of energy and an end product. Also Herrera is surprisingly good, for a player with his stats. Might be worth giving him a run before splashing out further. I get this, and maybe I'm not using him correctly, however, in my lost save, he just always seemed to miss several chances before scoring(as a Target Man, and as a Complete Forward), and I usually having a preference for pacy, creative forwards. Rashford's stats make him better out wide, I know, however I have Martial there who is probable my most effective goalscorer and match winner in the second half of the season(Sanchez quite dominant in the first, but tails off). He averages a goal every 86 minutes which was the highest in the league. Also, my right wingers are usually traditional out-and-out wingers, so Rashford isn't in that mould. I feel my new save would be no different, therefore he's quite undroppable. That leaves me with a Rashford/Martial rotation option, which I don't like. I too in my earlier years had that conundrum, however you are at the stage where neither player will complain too much at being rotated. However if you give either enough playing time they will become world class. I would as mentioned before consider changing up from a Winger to Raumdeauter on the right though (and just watch the assists pile up) in my game I used Mata, Mkhitaryan and Rashford in this position, all three broke the league record for assists in a season at one point or another. We all know that quality home-grown players are at a minimum for United, so I usually want my first XI ti always have at least 3 English players in the Matchday XI(hence why Shaw is still my main LB). I looked at perhaps Shaw, Rashford as the main CF, and Lingard on the right(temporary, not permanent) allowed me to meet that requirement, and if Alli came in, even better, even though I prefer Dybala. I've also had to consider this because the English players in my team constantly want to leave for a new challenge and even those that gained citizenship(Young, Smalling, Jones, Valencia all want a new challenge, and Carrick's retirement as well. 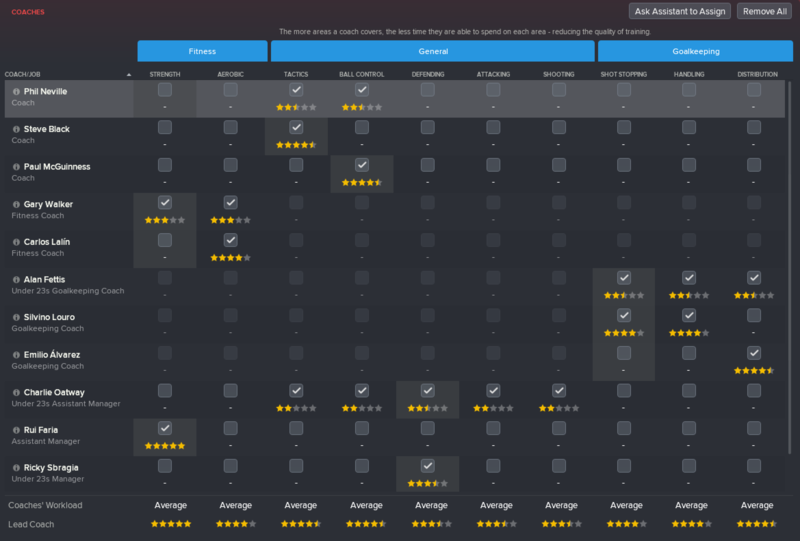 You have some very good youth players to come through, who can help with your HG quota, in my game I have Gomes, Gribbin, Tuanzebe and Puigmal all as senior squad members. I also had Traore as a member of the first team for a while, all will become international class if given the opportunity. Tuanzebe becomes immense, give him plenty of playing time. I think it would be wise to allow Jones and/or smalling to leave if they are wanting to and allow Tuanzebe to be a main part of your defence. Probably should have been a bit clearer on that, yes I play a 3 man midfield of DM(DLPd) and SV(A) with a CM B2B when playing a﻿way or against teams I expect to cause me issue. At home or against teams I expect to beat I move the CM to AMC. The partnership of DLP and SV has been very solid with or without the extra man. I guess a 3-man midfield it is, then. And gotta say thanks for the response. Kinda figured out what I need to do. I will go against you in terms of Savic, and maybe push for Alli though, as I like his tremendous potential for versatility, which is always useful, and pretty much just because he's English. 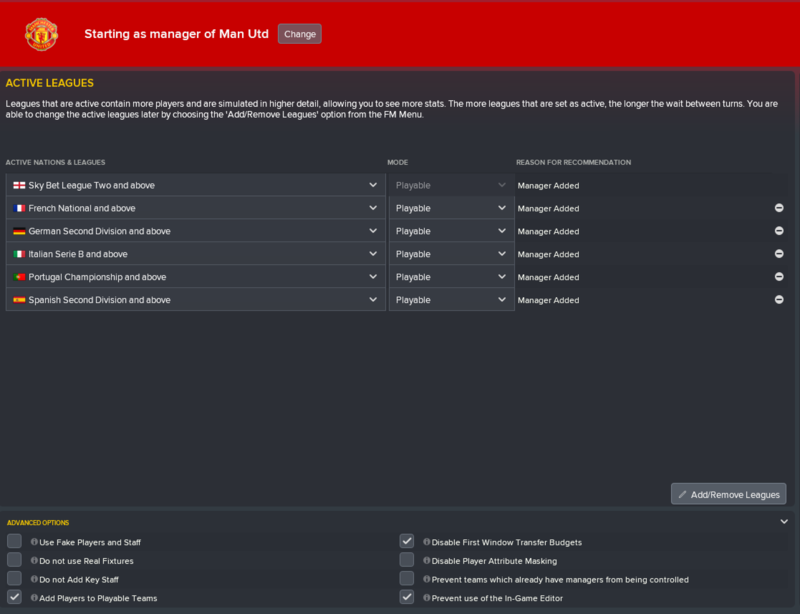 I never tend to manage the big Premier League clubs, but as a Man Utd fan I might give it a go once FM19 comes out. Anyone ever tried it with either signing just English players/youth team graduates? @dothestrand I'm sure plenty have - you've got so much money you could sign any Englishman not playing for City / Liverpool with ease. 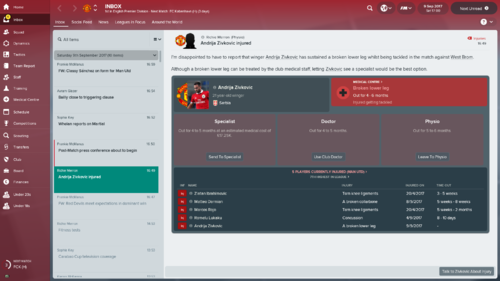 This thread might offer a bit of inspiration - he's basically turned United into a big-money version of Athletic Bilbao, only signing players from within 30 miles. 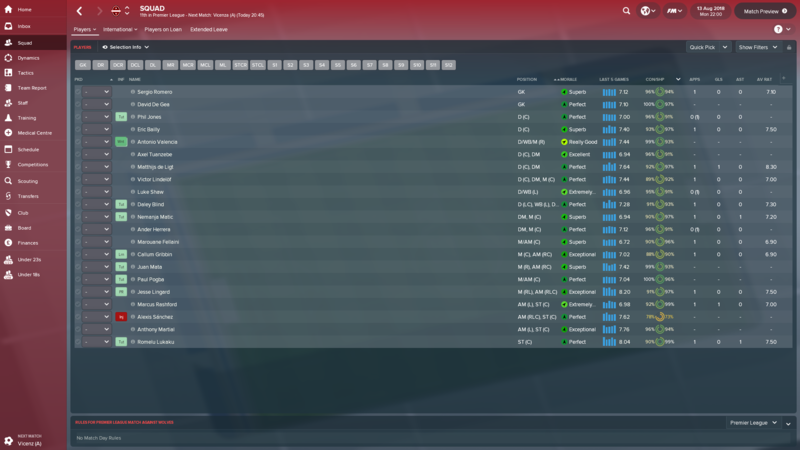 I did something similar on FM17 with Fiorentina (admittedly four seasons and 2 league titles in) where I only signed players born / trained in Tuscany. Cheers. That seems too extreme to me Everton look a good bet for English only so I've tried them. These are the reasons I still pick up this game. Nothing feels better than sticking it to City, and the popping them to the title! By the way, can anyone recommend a higher quality British left-back option to Luke Shaw? He 's far too injury prone for me(played just 13 games in my first season) and wants 150k a week, which is not even a remote possibility for me(I sold Bailly just because he was wage hungry as well). Kieran Tierney moved to Man City recently, and Demi Mitchell looks more of a winger, nor does he seem good enough. So I'm looking for a top tier or potential top tier British left-back essentially. Any recommendations? Offer Stoke the world for Josh Tymon. Ben Chillwell would the one I would recommend, he is happy to play back up to Shaw as I have both Shaw and Chillwell in my Spurs side. Yeah, I looked at him, but again, he seems more of an attacking option. But I am considering him. I have Martial ahead who pretty much leaves Young/Rojo(Again, Shaw always injured) 1 on 1 or 2 on 1. It's the definite weakness my side. Something like 20 of 29 goals have come from that side. Valencia/Dalot on the right has no issues at all even though there's no tracking back there either. So I would at least like someone who can make that crucial tackle. I've looked at both of them. Not really sure who is the better option. I thought Tymon was pretty much the LB with greatest potential in the world in FM18. He's less good in FM19. Thanks. I'll definitely look into this one. Anyone got any idea about how good Tahith Chong and Angel Gomes become in the future? In 19 both seem highly rated.. But 19 should probably see a new thread. In 18 I don't think I ever bothered with either. I'm approaching the end of my fifth season with United, and it's been my most enjoyable save since leading Rai and PSG to Champions League glory CM9798! Completely dominated the premier league during my tenure with the most recent title being secured with six games in hand! Was well chuffed with the boys after a stellar season. Done extremely well in the Champions League as well winning two out of four finals reached with a tricky semi final tie against a star studded Monaco side to make it five out of five for finals reached. As far as tactics go, mainly using a 4-2-3-1 with a ball winner and a dlp in midfield, alternating with a 4-3-2-1 with two ball winners sitting in the middle of the park for tough games. 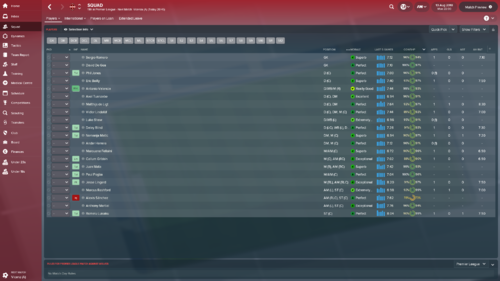 My midfield additions were Thiago Maia and Amadou Diawara to sit on either side of the overpayed Pogba, both performing pretty well for BWM's (always struggle to get one of these to consistently get high ratings, and both wanted by the likes of PSG and Barce) with Timoth Fosu Mensah, who is really starting to show some ability providing back up for these two. In the AM and striker department its all about Lukaku, absolute dynamite! He's got 39 in 43 this season. Got Martial flying down his left and Julian Brandt down the right with none other than two time World Player of the Year Griezmann, sitting in the number 10 position pulling all the strings.